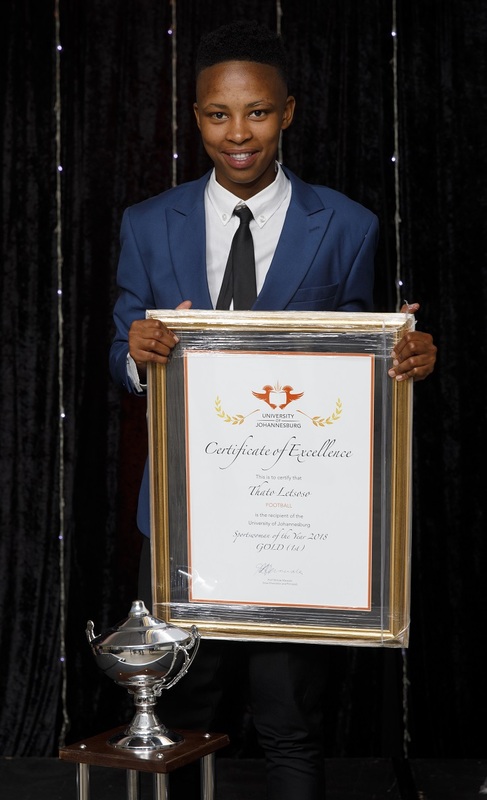 A determination to succeed has seen University of Johannesburg soccer star Thato Letsose earn the varsity’s Sportswoman of the Year award at a gala function this month. The 22-year-old sports psychology student, who received her first cap for South Africa this year, said that failing to achieve goals she set herself was a big motivating factor in her development as a player. “The more I fail, the more I want to try again until I master it,” she said. “That, I feel, has been a big part of my success. Besides playing for Banyana Banyana, she captained the UJ team to victory in the University Sport South Africa tournament in Port Elizabeth in July and led the Ussa squad to the gold medal in the Confederation of University and College Sports Association Games in June. Born in Bloemfontein, but now living in Auckland Park in Johannesburg, Letsose said the award meant a great deal to her, but was also important for women’s soccer. She added that she loved the game because of the skills it helped you to develop. “Also, meeting new people and developing strong friendships are among the many benefits of the game. Letsose said her three years at UJ had been important in her soccer development. “Being at the varsity has taught me a lot in terms of expanding my skills, as well as learning to master a number of different positions.